Conservatives Of The Upstate: Fact or Fiction Regarding Recent Media Coverage Of Pickens County School District? 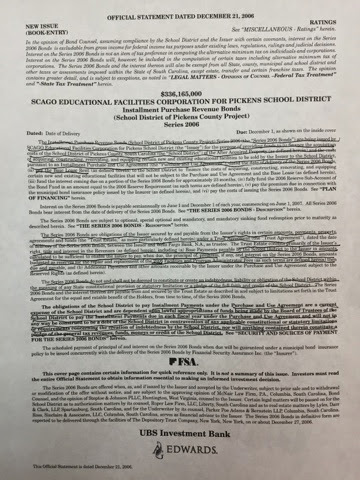 Fact or Fiction Regarding Recent Media Coverage Of Pickens County School District? No summary of recent meetings or editorial has said a word about the Conservatives of the Upstate contesting the legality of such action. Article 11 Section 3 of the SC Constitution specifically says that the state is responsible for funding schools for the children. They have collected the lottery and added 5% in sales taxes over the years for educational purposes, and each time the Legislature has put the money in the general fund and spent large amounts of it on other things. The people of Pickens County are not responsible for funding education or paying for the buildings. Had the money they taxed us for and the lottery been put into education, there would be schools on every corner and the teachers could make $100,000 each. Bu,t by statutory law and plucking at the citizens "chudrun" strings, they have pushed the responsibility to the counties. If the school board needs to fight, it is not with our poor citizens who make less than an average of $24,000 a year (reported by Appalachian Council of Governments), while the teachers make an average of $48,000 (report same). If you take the current teachers salaries out of the average, the people make less than $17,000. Most workers in Pickens County often have to have 2 jobs just to make ends meet. The info that has been given about the teacher raises is fictitious. Teachers have received multiple cost of living increases and can EASILY gain raises through enrichment and certifications, while many have seen decreases in the wage because of inflation. Now let me cover the refinancing of the Revenue Bonds that are owned by SCAGO. The School Board DOES NOT own the bonds, they cannot own the bonds by law, they cannot pay the refinancing fee because that would prove ownership of the bonds which they cannot own. In my opinion, SCAGO is the only entity that can refinance and they must pay the refinancing fee. This school board has over-collected taxes and failed to refund as required by law. They have spent the interest on the bonds that did not belong to them. If you say that they were entitled to the interest, then they have exceeded the 8% constitutional law. When this debacle first came into being, it was improperly set up in the wrong accounts in the treasurers office, I have not been able to find out who told the treasure to mingle the taxes paid on the SCAGO Bonds and the General Obligation debt which carries the full faith and power of the School Board and the revenue bonds which do not. This is costing the Pickens County citizens $391,000,000 over 25+ years. It also is against the law because Pickens County has broken the 8% collection rule.